As of 2018, nearly 6 in 10 women aged 16 and older (57.1 percent) worked outside the home, compared with 33.9% in 1950 and 43.3% in 1970. To determine female labor force participation rate in the United States from 1990 to 2018, CEOWORLD magazine used data from the Bureau of Labor Statistics; 1990 to 2018; aged 16 and older. 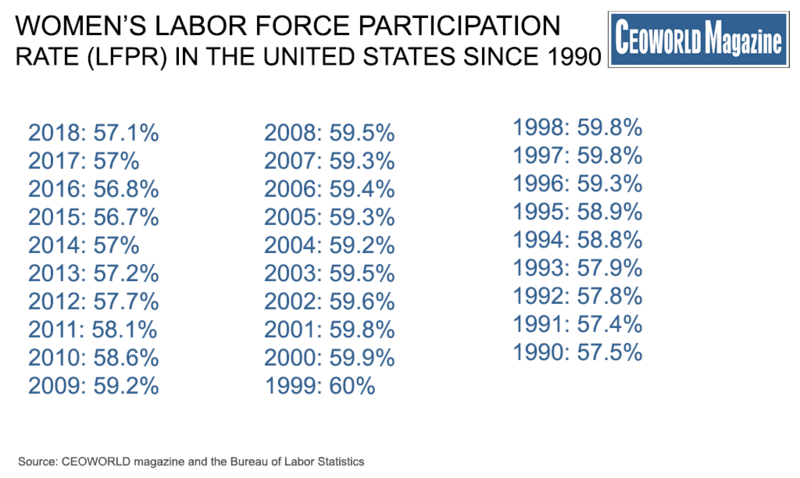 The data below shows the unadjusted female labor force participation rate from 1990 to 2018. In 2018, about 57.1% of the female labor force, participated in the job market. The labor force participation rate (LFPR) refers to the number of people available for work as a percentage of the total population. Where the Civilian Non-Institutionalized Population = everyone living in the U.S. who is 16 or older minus those on active duty in the Armed Forces and minus inmates of institutions such as prisons, nursing homes, and mental hospitals. # Top 500 Best Universities In The World For 2019. Medicine And Health Science Degrees. | Life Science Degrees. | Physical Science Degrees. | Psychology Degrees. | Arts and Humanities Degree. | Education Degrees. | Social Sciences Degrees. | Business And Economics Degrees. | Computer Science Degrees. | Engineering And Technology Degrees.